I had one day left on my desert jaunt before heading home. I'd spent the third night in a row camped outside Beatty, NV, only a short drive from Death Valley NP. I had planned to spend the day hiking to Chloride Cliff and other summits to the south of Daylight Pass, but the weather was proving more of a factor than anticipated. It was cold and blustery, the sky roiling with clouds that looked like they might bring rain or snow. Rather than commit to a longish hike (my van was ill-equipped for the high-clearance drive to Chloride Cliff) that might be spoiled by weather, I decided to do a series of shorter hikes to summits I'd found in Purcell's Rambles & Scrambles and had noted the day before when I was hiking the north side of the pass. Ultimately, snow would drive me off the mountain and west to bluer skies on the other side of the park. No shortage of peaks there, either, as it turned out. These two summits are located on the east side of Daylight Pass a short distance from the highway. I parked at a convenient turnout that would give me easy access to both summits. The Loner is the lower of the two, but more impressive, with rocky features that made for better scrambling. Sunrise came shortly after I had started for The Loner from the west side, a direct route of less than half a mile that took just over 15min. The sun's moment had been ever so brief, less than a minute before it was hidden again by a layer of clouds. Looking northeast I could see that precipitation had already begun falling over the Bullfrog Mtns in the distance. I wasted no time in heading down the southeast side of The Loner and then south to the higher Boundary Monument a mile away. 35min was spent in getting from one summit to the other. As the name suggests, the CA/NV border goes directly over the summit, a benchmark noting the invisible line almost directly over the highpoint. The monument was first established in 1899, some 26yrs after the erroneous Von Schmidt Line of 1873 had placed the border a mile further east. John Vitz had placed a register here in 2000, only a few months before the summit was visited by Gordon & Barbara. A few other interesting scraps had been left by Andy Smatko and his pal Bill Schuler who climbed it independently in 1988 on the same day. The weather was growing more iffy all the time and was now dropping snow on Prospect Peak only a few miles to the north. I quickly tucked the register away, put on all my warm clothes and jogged back down towards the highway. I didn't quite manage to get back to the van before the snow started pelting me, but luckily it was only a few minutes' worth and I didn't get more than a bit damp. I expected to be done for the day and to start heading home early, but as I drove west across Death Valley and SR190 I found the weather improving - partly clear skies and little wind. By the time I had reached Panamint Springs it was quite pleasant and I decided to get some more hiking in. 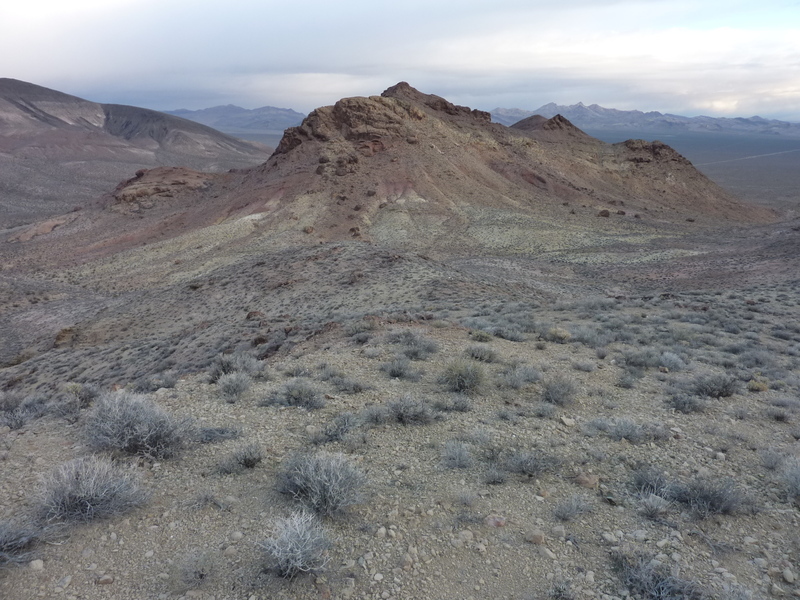 The Darwin Hills are found just outside the western boundary of Death Valley NP and south of SR190. Extensive mining took place here in bygone days and some impressive ruins and the barely existing town of Darwin still survive to the south. A swath of land northeast of the larger hills and adjacent to the park have been preserved as the Darwin Falls Wilderness. The highpoint of this is a small nubbin next to Darwin BM (I had climbed the latter, but not the highpoint a year earlier). Aside from the highpoint which wasn't as easy to access with the van, the most prominent point in the wilderness is an unnamed summit alongside SR190 with 462ft of prominence. It seemed a short enough hike, so it was to this that I turned my attention. The summit is less than 2/3mi from the highway at its closest approach to the northeast. I parked near this point and climbed to the summit in about 30min. Composed primarily of broken volcanic rock, the trick is finding a line of least annoyance over softball-sized rocks that cover portions of the slopes on the northeast side. A cliff band near the summit is easily surmounted through one of several weakness that can be found. There are two flattish points vying for the highpoint. The topo map shows an extra contour and a spot elevation at the southern point, but the extra contour appears to be an error. I found no register or cairn in either of the locations though I made a modest search around each. My descent was much the same route after exploring a third point to the northeast that turned out to be lower than the other two. Not a very satisfying summit, but there are nice views overlooking Darwin Mesa and Rainbow Canyon to the east. Two fighter jets raced by as I was climbing, sweeping up in a high arc before diving down into Rainbow Canyon and out of sight. I was envious that they were having more fun than I. Two random summits on either side of Saline Valley Rd, each with about 300ft of prominence. I had hiked to the nearby Jack Gunn Peak a year earlier, but came back for yet more obscurity. The two summits aren't particularly memorable for the climbing but the northern one, Peak 5,740ft has an old mining cabin on its south side, a short distance from the road. I had not noticed this on my previous drive through the area. The cabin is somewhat maintained (as minimally as any public-use cabin typically is), worth a quick visit if you're in the area. Writing is scrawled on the unfinished walls (I added my own name to the ceiling) and there are various trinkets and furnishings to amuse one for at least a few minutes if not an overnight stay, assuming you can keep the fear of hantavirus quelled.